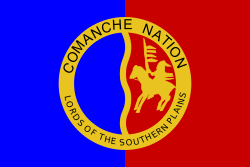 اینگیلیس دیلی, Comanche The Comanche /kəˈmæntʃiː/ (شابلون:Lang-com) are a Native American nation from the Great Plains whose historic territory, known as Comancheria, consisted of present-day eastern نیومکزیکو ایالتی, southeastern کولورادو ایالتی, southwestern کانزاس ایالتی, western اوکلاهوما ایالتی, and most of northwest تکزاس ایالتی and northern Chihuahua. The Comanche people are federally recognized as the Comanche Nation, headquartered in لتن، اوکلاهوما. After European contact, the Comanches were hunter-gatherers with a horse culture. As many as 45,000 Comanches may have been alive in the late 18th century. They were the dominant tribe on the Southern Plains and often took captives from weaker tribes during warfare, selling them as slaves to the Spanish and later Mexican settlers. They also took thousands of captives from the Spanish, Mexican, and American settlers. Today, the Comanche Nation has 15,191 members, around 7,763 of whom reside in tribal jurisdictional area around the Lawton, Fort Sill, and surrounding areas of southwest Oklahoma. The Comanche Homecoming Annual Dance is held annually in والترز، اوکلاهوما, in mid-July. The Comanche language is a نومی دیللری language of the یوتو آزتک دیللری family, sometimes classified as a Shoshoni dialect. Only about 1% of Comanches speak their language today. The name "Comanche" is from the Ute name for them, kɨmantsi (enemy). The tribe operates its own housing authority and issues tribal vehicle tags. They have their own Department of Higher Education, primarily awarding scholarships and financial aid for members' college educations. Additionally, they operate the Comanche Nation College in Lawton. They own 10 tribal smoke shops and four casinos. The casinos are Comanche Nation Casino in Lawton; Comanche Red River Casino in Devol; Comanche Spur Casino, in الجین، اوکلاهوما; and Comanche Star Casino in والترز، اوکلاهوما. In 2002, the tribe founded the Comanche Nation College, a two-year tribal college in Lawton. It has since closed. Each July, Comanches from across the United States gather to celebrate their heritage and culture in Walters at the annual Comanche Homecoming powwow. The Comanche Nation Fair is held every September. The Comanche Little Ponies host two annual dances—one over New Year's and one in May. The Comanche emerged as a distinct group shortly before 1700, when they broke off from the Shoshone people living along the upper پلت چایی in وایومینگ ایالتی. In 1680, the Comanche acquired horses from the Pueblo Indians after the Pueblo Revolt. They separated from the Shoshone after this, as the horses allowed them greater mobility in their search for better hunting grounds. Nicolas de La Fora's 1771 map of the northern frontier of یئنی ایسپانیا shows the Comanche territory in the upper left of the map above the Red River. The horse was a key element in the emergence of a distinctive Comanche culture. It was of such strategic importance that some scholars suggested that the Comanche broke away from the Shoshone and moved southward to search for additional sources of horses among the settlers of یئنی ایسپانیا to the south (rather than search for new herds of buffalo.) The Comanche may have been the first group of Plains natives to fully incorporate the horse into their culture and to have introduced the animal to the other Plains peoples. From نکیتاش، لوئیزیانا in Spanish Louisiana, Athanase de Mézières reported in 1770 that the Comanches were "so skilful in horsemanship that they have no equal, so daring that they never ask for or grant truces, and in possession of such a territory that... they only just fall short of possessing all of the conveniences of the earth, and have no need to covet the trade pursued by the rest of the Indians." 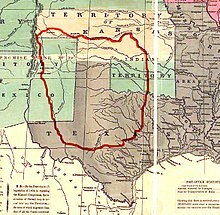 Their original migration took them to the southern Great Plains, into a sweep of territory extending from the آرکانزاس چایی to central Texas. They reached present-day New Mexico and the Texas Panhandle by 1700, forcing the Lipan Apache people ever southward, defeating them in a nine-day battle along the Rio del Fierro (Wichita River) in 1723. The river may be the location mentioned by Athanase de Mézières in 1772, containing "a mass of metal which the Indians say is hard, thick, heavy, and composed of iron", which they "venerate...as an extraordinary manifestation of nature", the Comanche's calling it Ta-pic-ta-carre [standing rock], Po-i-wisht-carre [standing metal], or Po-a-cat-le-pi-le-carre [medicine rock], the general area containing a "large number of meteoric masses". By 1777, the Lipan Apache had retreated to the ریو قرانده چایی and the مسکلیروو، نیومکزیکو Apache to Coahuila. During that time, their population increased dramatically because of the abundance of buffalo, an influx of Shoshone migrants, and their adoption of significant numbers of women and children taken captive from rival groups. The Comanche never formed a single cohesive tribal unit, but were divided into almost a dozen autonomous groups, called bands. These groups shared the same language and culture, and rarely fought each other. They were estimated to have taken captive thousands of people from the Spanish, Mexican, and American settlers in their lands. Curtis Marez suggests that this contributed to the development of mestizaje in the borderlands, as the descendants of such captives were mixed-race. By the mid-19th century, the Comanche were supplying horses to French and American traders and settlers, and later to migrants passing through their territory on the way to the California Gold Rush, along the California Road. [نیازمند منبع] The Comanche had stolen many of the horses from other tribes and settlers; they earned their reputation as formidable horse thieves, later extending their rustling to cattle. [نیازمند منبع] Their stealing of livestock from Spanish and American settlers, as well as the other Plains tribes, often led to war. [نیازمند منبع] The Comanche also had access to vast numbers of feral horses, which numbered about 2,000,000 in and around Comancheria, and which the tribe was particularly skilled at breaking to saddle. In the late 18th and early 19th centuries, the Comanche lifestyle required about one horse per person (though warriors each possessed many more). With a population around 30,000 to 40,000 and in possession of herds many times that number, the Comanche had a surplus of about 90,000 to 120,000 horses. As an example of such political and kinship-based division, the Yaparʉhka, identified as a separate division. Because of cultural and linguistic differences from other Comanche bands, they became the "(Yap)Root-Eaters", in contrast to the Kʉhtsʉtʉhka ("Buffalo-Eaters"). The Yaparʉhka division was composed of several residential local groups, such as the Ketahtoh Tʉ, Motso Tʉ, and Pibianigwai. In contrast to the neighboring Cheyenne and Arapaho to the north, the Comanche never developed a political idea of forming a nation or tribe. The Comanche recognized each other as Nʉmʉnʉ and bands seldom fought against each other; but the Kwaarʉ Nʉʉ pursued policies against the Spanish and Indian settlements in New Mexico independently of the Kʉhtsʉtʉhka. As a consequence, at the time when Comanche society was breaking down, the once respected and feared Penatʉka Nʉʉ provided U.S. Army Indian Scouts for the Americans and Texans against their still fighting and free-roaming Comanche kin. The band was the primary social unit of the Comanche. A typical band might number about 100 people. Bands were part of larger divisions, or tribes. Before the 1750s, the three Comanche divisions were: Yamparikas, Jupes, and Kotsotekas. In the 1750s and 1760s, a number of Kotsoteka bands split off and moved to the southeast. This resulted in a large division between the original group, the western Comanches, and the break-away Kotsotekas, the eastern Comanches. The western Comanche lived in the region of the upper آرکانزاس چایی, کانادا چایی, and رد استوور چایی Rivers, and the Llano Estacado. The eastern Comanches lived on the Edwards Plateau and the Texas plains of the upper Brazos and Colorado Rivers, and east to the Cross Timbers. Over time, these divisions were altered in various ways. In the early 19th century, the Jupes vanished from history, probably merging into the other divisions. Many Yamparikas moved southeast, joining the eastern Comanche and becoming known as the Tenewa. Many Kiowa and Plains Apache (or Naishan) moved to northern Comancheria and became closely associated with the Yamparika. A group of Arapaho, known as the Charitica, moved into Comancheria and joined Comanche society. New divisions arose, such as the Nokonis, closely linked with the Tenewa; and the Kwahadi, who emerged as a new faction on the southern Llano Estacado. The western-eastern distinction changed in the 19th century. Observers began to call them Northern, Middle, and Southern Comanche. One of the largest groups, as well as the southernmost, lived on the edge of the Edwards Plateau and east across to the Cross Timbers, and became known as the Penateka, (Penatʉka Nʉʉ) Southern Comanches. In the eastern part of the Comancheria, between the Colorado and Red Rivers, roamed the Nokoni (Nokoni Nʉʉ — ‘Movers’, ‘Returners’). South of them were the strong, associated smaller bands or residential groups of the Tenawa (Tahnahwah or Tenahwit — ‘Those Who Live Downstream’) and Tanima (Tanimʉʉ, Dahaʉi, or Tevawish — ‘Liver-Eaters’). Together, the Nokoni, Tenawa, and Tanima were called the Middle Comanche. Just north of the Nokonis in the Red River Valley, between the Red and Canadian Rivers, lived the numerous residential local groups of the powerful Kotsotekas (Kʉhtsʉtʉʉka — ‘Buffalo-Eaters’); they took their name from the large buffalo herds that were always in their territory. The northernmost Comanche band was the Yamparikas (Yaparʉhka or Yapai Nʉʉ — ‘(Yap)Root-Eaters’). As the last band to move onto the Plains, they retained much of their Shoshone tradition. Because the Kotsoteka and Yamparika lived in the northern part of the Comancheria, they were called the Northern Comanche. The last large group was known as Kwahadis (Quohada or Kwaarʉ Nʉʉ/Kwahare — ‘Antelope-Eaters’), originally Kotsoteka-residential local groups that moved south out of the سیمارون چایی onto the desert plains of the Llano Estacado. They emerged as a new division in the 19th century. Though the western-eastern distinction had changed in the 19th century, these people were classified as Western Comanche because of their relative isolation on the westernmost edge of the Comancheria. کورمانجی‌‌لر (اینگیلیسی‌جه: Comanche، عرب‌جه: كومانشي (قبيلة)، آنادولو تورکجه‌سی: Komançiler، فارسجا: کومانچی) - بیر قومی گروه چوْخ‌لاری آمریکا بیرلشمیش ایالتلری, اوکلاهوما ایالتی, تکزاس ایالتی, نیومکزیکو ایالتی دا یاشاییرلار. چوْخ‌لاری آمریکا بیرلشمیش ایالتلری, اوکلاهوما ایالتی, تکزاس ایالتی, نیومکزیکو ایالتی دا یاشاییرلار. ↑ ۱٫۰ ۱٫۱ ۱٫۲ ۱٫۳ 2011 Oklahoma Indian Nations Pocket Pictorial Directory (PDF) (November 2011). آرشیولنیب اصلی نۆسخه‌دن on May 12, 2012. یوْخلانیلیبJanuary 2, 2012. ↑ McLynn, Frank. "Review of Pekka Hämäläinen, The Comanche Empire". Literary Review. Archived from the original on 2008-08-20. ↑ Marez, Curtis (June 2001). Signifying Spain, Becoming Comanche, Making Mexicans: Indian Captivity and the History of Chicana/o Popular Performance. American Quarterly 267–307. DOI:10.1353/aq.2001.0018. ↑ The Official Site of the Comanche Nation ~ Lawton, Oklahoma. یوْخلانیلیب2012-06-18. ↑ ۶٫۰ ۶٫۱ Comanche – American Indians. آرشیولنیب اصلی نۆسخه‌دن on 2013-10-29. ↑ Comanche Timeline. Comanchelanguage.org. آرشیولنیب اصلی نۆسخه‌دن on 2012-07-19. یوْخلانیلیب2012-06-18. ↑ Marez, Curtis (June 2001). «Signifying Spain, Becoming Comanche, Making Mexicans: Indian Captivity and the History of Chicana/o Popular Performance» 53 (2): 267–307. DOI:10.1353/aq.2001.0018. ↑ Penateka Comanches ~ Marker Number: 16257. Texas Historical Commission (2009).